A DOG has confirmed he is ready to begin negotiations for letting go of a stick. 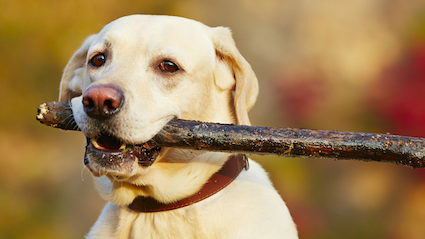 Larry, a four year-old labrador said he was happy to begin talks but stressed there was no guarantee the stick would be given back straight away. He added: “Initially, I would be willing to let the stick go a little loose whilst still keeping it clenched in my teeth. I will also no longer be growling at the prospect at giving the stick up. “In the long run, I’ll obviously be looking for the stick to be thrown again so I can catch it, bring it back to you and let you look at me with it in my mouth. Larry’s owner Emma Bradford said, “I’m happy to claim he’s a good boy six or seven times if it’ll move things along. 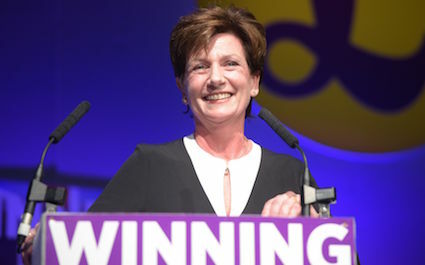 DIANE James, the new leader of UKIP, has promised to come up with a reason for the party’s existence before 2017. James told members that she was working on a political purpose for the party and shared a few first-draft ideas which included ‘refocusing solely on fisheries’, ‘enforcing hard line on waistcoats’ and ‘something a bit like the Scouts’. She continued: “UKIP has fought, and won, the battle to take Britain out of the EU, regain our sovereignty and take back control of our country’s destiny. “Which is all well and good but now we’ve done all that we find ourselves at a bit of a loose end. “I mean yes we’ll press the UK government to make sure that Brexit is Brexit, but legal definitions and trade negotiation aren’t really our strengths. “So at this stage we’re open to suggestions. A chain of patriotic shops selling British-only goods? A Mars mission? A Battle of the Referendum re-enactment society?